Akron, Ohio, August 9, 2012 — Scientists already know that the tiny hairs on geckos' toe pads enable them to cling, like Velcro, to vertical surfaces. Now, University of Akron researchers are unfolding clues to the reptiles' gripping power in wet conditions in order to create a synthetic adhesive that sticks when moist or on wet surfaces. 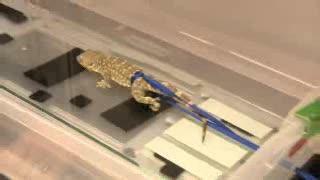 Place a single water droplet on the sole of a gecko toe, and the pad repels the water. The anti-wetting property helps explain how geckos maneuver in rainy tropical conditions. However, saturate that same toe pad in water or drench the surface on which it climbs, and adhesion slips away, the researchers say. Researchers Alyssa Stark and Tim Sullivan test the adhesion of a geckos feet in water. Their findings may help improve the adhesion of bandages, sutures and similar items in moist environments. After close study of the tiny hairs at the bottom of gecko feet that enable them to cling to surfaces, Dhinojwala and his colleagues have already developed a dry synthetic adhesive, comprised of carbon nanotubes, that outperforms nature's variety. Now, with these new findings, Dhinojwala and his colleagues are one step closer to unfolding the secrets behind gecko toe adhesion in wetness.